The recent arthritis awareness campaign has helped to increase our understanding of this all-to-common medical condition. While most discussion about arthritis concentrates on osteo and rheumatoid arthritis, gout is actually the form of arthritis that was first recognised as being a joint disease distinctly different from the others. Medical historians tell us that even before the time of Christ, various tribal remedies were offered, some successfully, to relieve the extremely painful symptoms of gout. Shakespeare wrote about the condition ("a pox on this gout") in Henry IV, and Mozart's talented but less remembered father died after a particularly long and painful attack. Mozart, the elder, knew the benefits of taking a first aid kit on his constant travels. His portable medicine chest contained a variety of remedies including one known as schwarzpulver (black powder) - a mixture of charcoal, deer antler, myrrh, coral, dried earthworm, frog legs and placenta. Alas, apparently he had no autumn crocus - a herbal product that until 30 or 40 years ago was the only preparation considered useful to treat gout. Cartoons from the nineteenth century depict the dramatic features of the disease. They often show a fat male sitting at a table laden with food and a prominently displayed wine bottle or punchbowl. His foot was usually well wrapped and supported on a stool. Historically, gout was said to affect the socially and intellectually privileged and the rich rather than the poor. We know now that gout is a good example of a disease that is very often inherited. However, as true today as centuries ago, excesses of certain foods and beverages might trigger an attack. 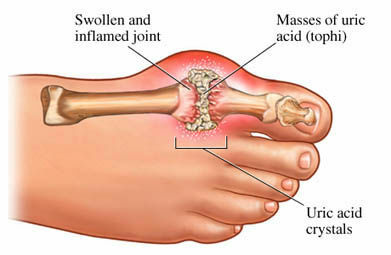 People with gout - and it mostly affects men - have a high level of a substance called uric acid (or urate) in the blood. Under certain circumstances the uric acid can form crystals that are deposited in the joints; the big toe usually succumbs first. The symptoms are typically redness and swelling with heat and pain. All arthritic conditions are painful but gout can be agony. Happily it soon comes under control when adequately treated. In fact, these days gout is virtually a preventable disease. The major problem now, in the prevention and treatment of gout, lies not in the absence of effective medical treatment but in our inability to persuade people with gout to take their medication continually, even when there are no symptoms. Acute attacks of gout are treated with the non-steroidal anti-inflammatory drugs (NSAIDs). Subsequently, the blood levels of uric acid are controlled by a medication, which should be taken regularly and perhaps for evermore despite the absence of symptoms.